Images taken via the iPhone on visiting the cardiac nurses lounge today. Indeed, it seems America is running to Dunkin. 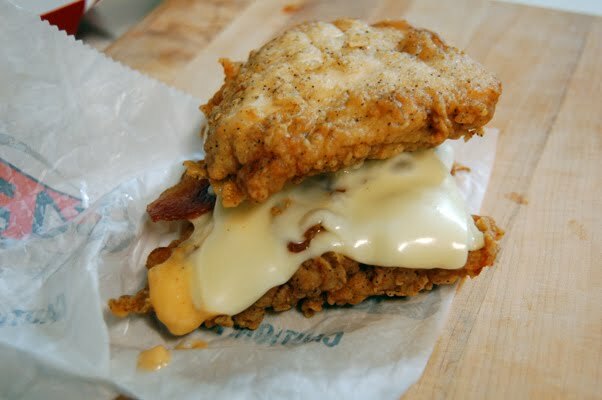 Now for the closer: KFC’s double down. Fried chicken as the bun, processed white flour, saturated fat, pork fat, dairy fat, special sauce and nearly an entire days worth of sodium masquerading as food. We are clearly losing the battle. In choosing childhood obesity, Mrs Obama has selected a steep, long rocky hill to climb, and one of her tires just went flat. No worries though, soon we will all be insured. The “squishers” will be happy to squish, and stent the clogged arteries. Hopefully, there will be plenty of skilled doctors available in the future to do so. We’ll see. Somebody pass the tofu, swiss chard, arugula and fish oil capsules. I'm not so sure we need to worry about dietary saturated fat anymore. The January edition of American Journal of Clinical Nutrition says it's not related to cardiovascular disease. One of the co-authors is a Dr. Krauss, reportedly one of the world's leading lipid experts. This is one of the most interesting developments in the field of nutrition during the last couple decades. John, we call the new KFC sandwich at our house "the clogger" as chosen by my son. You damn right the squishers are happy to see this concoction. Maybe they can give it with a pack of cigs.